i thought of real artists. normally people would assume that once a painting is complete they would be hung up or sold or something to that effect. but mine just gets clipped away. my clipped away paintings above are actually painted with acrylic paint on artist canvas. for some reason i have like a huge roll of artist canvas which i bought 5 years ago (for no apparent reason). 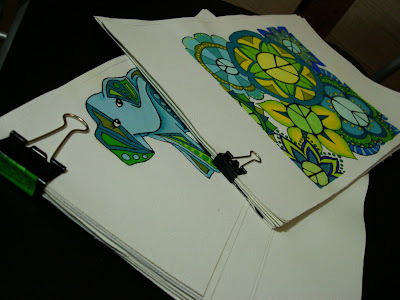 so now i cut them up mostly in A4 size so they fit my scanner :( and paint my designs on them. what sort of artist am i?!? i make my art with proper paint on a proper canvas, only to scan them and then clip them away! that's becos in my head, i make art and designs for crafting. funny ... but i haven't thought of it any other way. 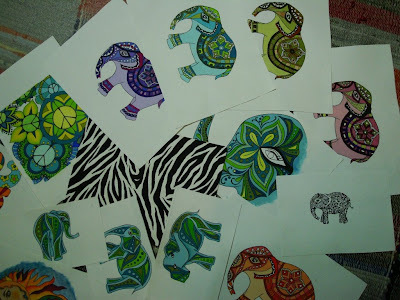 i do a lot of decoupage ... that's how i started making my own designs and painting them. at first it was like 'get the images from the net' , 'get decoupage paper from the craft store' but then it didn't feel really right. i was constantly gnawed by the feeling of copyright infringement, and let's be honest ... as an artist, would you like it if someone took your work and use it on their crafts and call it their own? well... i didn't like the gnawing feeling and i didn't feel that my work was solely my own. so i started designing my own designs and painting my own images. i was pondering today when i started looking at what i've painted so far ... which was not long ago cos i started crafting seriously only about before christmas last year... could i do more with paintings besides scanning them and reprinting them as craft paper? i think of my work as amateurish. never been to art school, never learned the technical stuff about art. 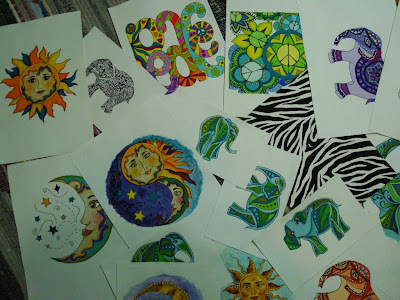 the only art lessons i went to was a folk art class about 6 years ago ... once a week 3 hours, with a group of ladies, for 6 months. i really enjoyed that tho. for the first time i was painting something that looked remotely like art :)) then i stopped becos i got pregnant and couldn't take the smell of the mediums. thus, i still feel that i'm bulldozing my way through ... shading? highlighting? proper strokes? blending? i dun even know if i'm doing them right! i just do them by instinct! HAH! what brought on today's ponderings, mutterings and ramblings? well ... i went into etsy and looked at real artists' work ... conventional art, mixed media art, oil, acrylics, watercolor ... it was like WOW! so... could i do this? or that? sell art as well, not just crafts? well ... i like the idea ... mixed media attracts me ... more room to explore and more freedom of expression? but ... must equip myself with more knowledge first! Luthien, I don't think there is a real definition for a "real artist", to define it is to box it in and I don't believe any of us want to be boxed in. So, explore and do what you love. I think you have a very unique way of expressing yourself. hey brenda :) i love what you said about we dun wanna be boxed in ... it's a wonderfully positive insight! i shall always keep that in mind :) thank you! hey carolyn :) thank you for your confidence in me :)) i'll never forget who was my first ever customer at etsy!!! love ya! aw julia... thanks so much! i'm really really touched by what you said. thank you! Luthien your paintings are wonderful! I love that you paint "by instinct" - the best part of art for me is the playfulness of it! Art should be about expressing and trying to communicate feeling - you can teach perspective, colour theory and everything else but you can't teach soul! There's a saying that I love - "creativity is the freedom to make mistakes - art is knowing which ones to keep". aw angie! thank you! and i love the saying ... it's so very true and insightful! You my friend are a true artist. One does not need to go to school, if they have the talent in their blood and soul. Your work is amazing, and don't think otherwise. I think it is great that you don't use other people's art on your work. I would encourage you to do whatever you want and not let any idea of not knowing hold you back. Making art is a journey and when we need to know more we go out and learn it and then come back and make more... and on and on it goes. thank you so much melissa :)) ever supportive of my work ... really appreciate it my dear friend :) hope all is well with you and your new shop! Your work is beautiful! Art is a heartfelt thing and you prove that in the color, detail and love you put into your work! You are a wonderful Artist. And I'm happy I met you on my Journey!